Map Dimensions: 39 inches tall x 47 inches wide. Click here for more detail. 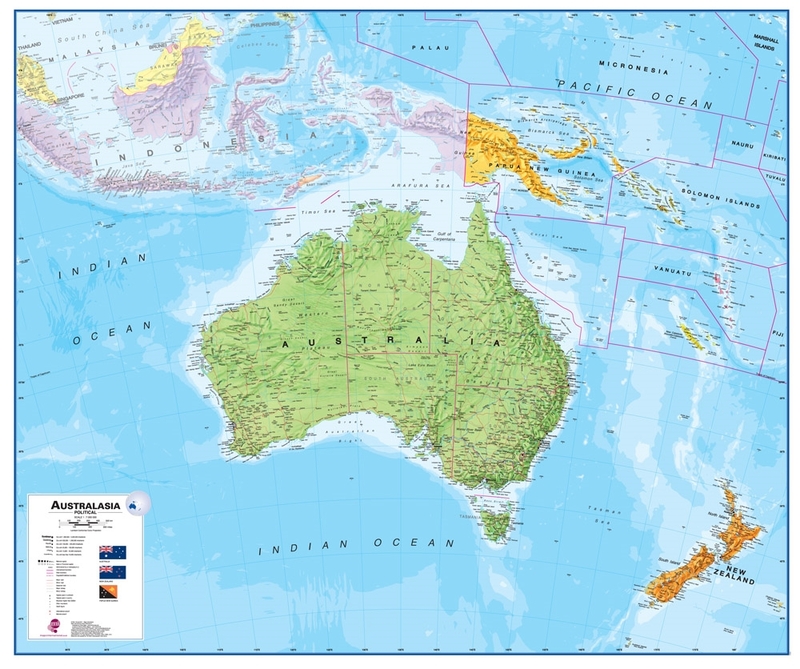 This is a great map of the Australasia Region showing the major countries, islands, and physical features. "Australasia" is a name used for the region of Oceania, Australia, New Zealand, New Guinea and the nearby islands of the western Pacific Ocean. It is a great map for students, schools, homes or offices. It shows the countries and islands of the Australasian region in great detail along with their intervening seas and oceans. Large, colorful, beautiful and detailed are perfect adjectives for this map. The lamination makes it a durable map that can easily be hung on a wall. You can write notes on it with dry-erase markers then wipe the map with a damp cloth to remove the marks. Post-it notes and similar lightly-adhesive markers also work well on this map and cleanly remove when you are finished. Display this map on a wall as an attractive and functional addition to your room, or keep it rolled in its sturdy tube for occasional use. It has wonderful blue oceans, brightly colored countries, and excellent geographic detail. Use it anywhere that a map is needed for education, display, or decor. It has a scale of 1:7,000,000 and is plotted using a Lambert Conformal Conic projection. Major cities and capital cities are marked on the map with symbols that indicate their relative population. Major highways and important roads are marked as red lines. Country, state and regional boundaries are shown as magenta lines. Airports are important transportation links to the many islands and remote areas of the Australian Outback. Airports with standing commercial service are shown with a red symbol. Major mountain ranges are shown in shaded relief. As an example, in New Zealand you can clearly see the Southern Alps, Tararua Range, and Huiarau Range. The Great Dividing Range stands out in Eastern Australia, and you can see it dissected by the numerous rivers that flow to the coast. The western and central areas of Australia are barren and arid. The Great Sandy Desert, Little Sandy Desert, Simpson Desert, Great Victoria Desert, and Sturt Stony Desert are all marked but not physically delimited. Plan or share your trip to Australia on this map! Oceans and islands are important parts of Australasia. Ocean depths are shown with blue color shading. That shading allows you to see shallow areas around the Great Barrier Reef and significant ocean trenches off Indonesia and in the Western Pacific. The large shallow shelf areas of the Arafura Sea, the Timor Sea and the Gulf of Carpentaria have long been important fisheries. More recently, they have become important areas for oil and gas drilling. Numerous island areas appear on the map in part or in their entirety. These include: East Timor, Palau, Micronesia, Marshall Islands, Nauru, Kiribati, Tuvalu, Solomon Islands, Vanuatu, and Fiji. Important parts of Australia's domain include New Caledonia, Coral Sea Islands Territory, Lord Howe Island, Norfolk Island, Ashmore and Cartier Islands, Christmas Island, and Cocos Islands. New Zealand's island areas include: Chatham Islands, Auckland Islands, and Bounty Island. Latitude and longitude lines are clearly marked as these are important references in ocean areas. On the land, major rivers are marked. The Darling, Murray and many other major rivers of eastern Australia are shown in blue. On New Zealand, major stores of freshwater can be found in the glacial lakes and glaciers of the Southern Alps. Many of the major intermittent lakes of the Lake Eyre Basin of Australia are shown with a crosshatch pattern. Australia has six states and all of them are shown. They are: New South Wales, Queensland, South Australia, Tasmania, Victoria and Western Australia. In addition, the Australian Capital Territory, the Northern Territory, New Caledonia, Coral Sea Islands Territory, Lord Howe Island, Norfolk Island, Ashmore and Cartier Islands, Christmas Island, and Cocos Islands are shown. This map includes New Zealand with its Chatham Islands, Auckland Islands, and Bounty Islands. The island of New Guinea and neighboring islands of the western Pacific are all important parts of Australasia. Many people enjoy having a nice collection of maps in their home. When they hear about important world events they can easily consult a good map for a greater appreciation of the event and a better understanding of world geography. This map is simple enough, yet detailed enough to serve as a home schooling resource. We want you to receive this map promptly and in perfect condition. To make that happen we will roll it face-inwards and insert it into a sturdy map tube. All of our large continent maps are shipped through the United States Postal Service by Priority Mail. They ship no later than the next business day after your order is placed. That will allow you to receive it at almost any United States destination in just a few days. (We regret that we are unable to ship orders outside of the United States.) Our customers in Hawaii, Alaska, APO, FPO and all official United States Territories are usually very pleased with the speed of their delivery. If you order other items at the same time as a map, your other items will be shipped in a separate package. Usually, two maps, ordered at the same time, are shipped in separate tubes.